In a large bowl, mix together ground beef, breadcrumbs, French onion soup mix, salt, pepper, ketchup and egg. Mix with a spatula or by hand to combine thoroughly. Using an ice cream scoop, place large scoopfuls of the beef mixture into lightly greased muffin tin cups. The mixture should dome slightly over the cups (and you should be able to fill at least 10 of the cups). Bake for about 40 minutes; after 30 minutes, drizzle extra ketchup on top of the meatloaves if desired. Bake until beef reaches a temperature safe for consumption and is a deep brown. Remove from oven and let rest 5 minutes before removing with tongs or a spoon. In a world full of gelees, reductions, bechamels and chiffonades, sometimes all we want is plain ol’ meat and potatoes. For me, that often comes in the form of meatloaf. I have loved this classic recipe ever since I was a kid. It’s not the most attractive food, to be sure, but it sure does hit the spot when I’m hungry! But even my growling stomach (and that of my husband, who is known to down three times as much food as a normal person) can’t always gobble down an entire meatloaf, so I’m left with half-eaten slices on plates and leftovers that, at least in our household of two, don’t stay fresh for very long. That’s where these Mini Meatloaves come in handy. You might be wondering where the “loaf” part of this recipe comes into the picture, and really, besides using traditional meatloaf ingredients, it is loaf-free. 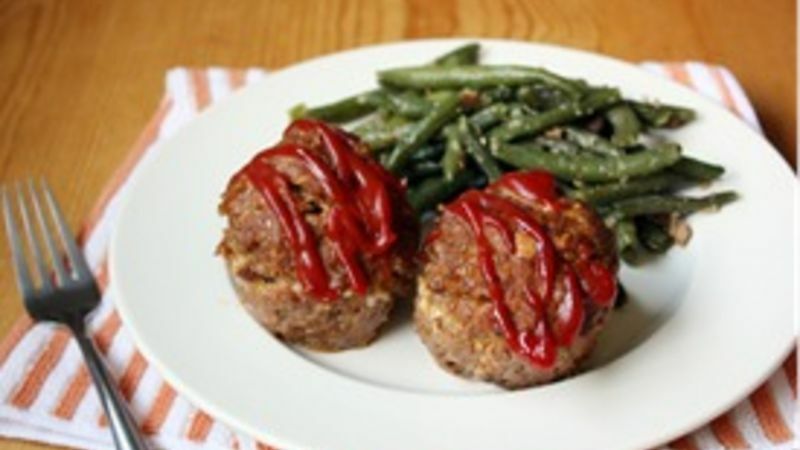 These mini meatloaves are made in muffin tins instead and look almost like giant meatballs (which we have used them for, too, to top our spaghetti). So, you can better control your portion for the meal and freeze the leftovers for a quick lunch or dinner the next day (or week, or month). Plus, they’re much cuter than a rectangle of meat on a platter! I like to season my mini meatloaves with Progresso Italian style breadcrumbs, which contain spices like oregano and basil, along with a packet of French onion soup mix and ketchup for extra tanginess. Barbecue sauce or teriyaki sauce also works well in place of the ketchup if you want a different flavor dimension. You can even use ground turkey in place of lean ground beef for a different taste. Part of the reason I enjoy this recipe so much – in addition to how easy it is to make – is its versatility. The next time you’re craving a good old-fashioned meatloaf, try this miniature version. They’ll fulfill the craving without filling you up too much – and you’ll have another meal waiting for you in the freezer when you need it! Speak Up: What do you cook when there’s no time to cook? Do share!